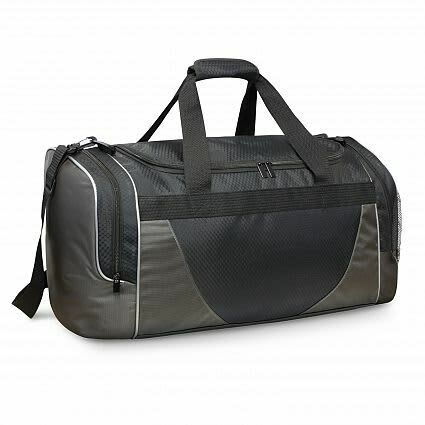 This large and tough duffle bag would be very popular for travel or taking all of your kit to the gym or sports centre. It has a corporate look and with your branding would be a popular promotional bag to use in a marketing campaign or as a reward for your staff. Superior large duffle bag which is manufactured from gunmetal coloured 600D polyester with Black ripstop nylon accents and silver piping. It has strong woven carry handles with a Velcro wrap and an adjustable shoulder strap which is removable. 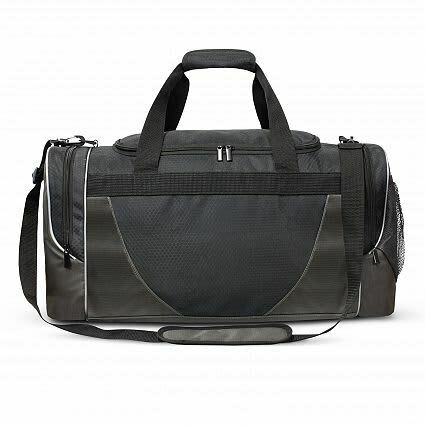 Excelsior has two zippered external pockets, one of which is a shoe bag which can also be used for wet gym gear etc. Other features include an external mesh pocket, a sturdy internal base board and strong external plastic feet. H 285mm x L 585mm x Gusset 265mm. Digital Transfer: 200mm x 100mm (top). Embroidery: 120mm x 60mm (sides).